How Many Grams of Flaxseed in a Tablespoon? How many grams of ground flax seed should you take a day? What a fun question! It brings me back to my days of living in Papua New Guinea where my Aussie friends used grams for cooking! So, this is going to be different for Whole Flaxseed and Ground Flax (our Flakes of Gold-always be sure you buy cold milled ground flax or grind your own). 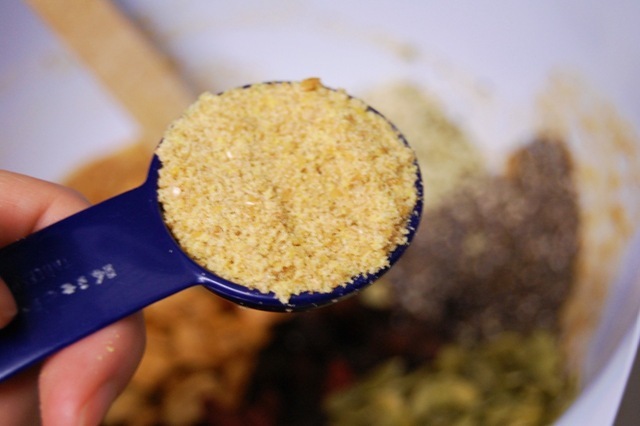 For our Flakes –cold milled ground flax, 1 Tablespoon = 6.6grams. -which, makes sense, because when you grind our flax, it almost doubles in size because of the high content Omega 3 oil in each seed. For Children and those with digestive sensitivities, they should start off with less. For more information for children and those with IBS, Crohns, etc, you can read more about how much Flaxseed here. The amount of flaxseed per day that we recommend is 2-4 Tablespoons ...in grams that is approximately 15-30 grams per day. You can eat your desired amount of flax up to 50 gm/day. Always listen to your body. You can eat more or less depending on how much other fiber you are also eating. We all need 25-35g of fiber a day and many of us are only eating 11g a day! Flax has so many health benefits and is easy to add to anything! Leave how many grams of flaxseed in a tablespoon to read more about Flax Health Benefits.